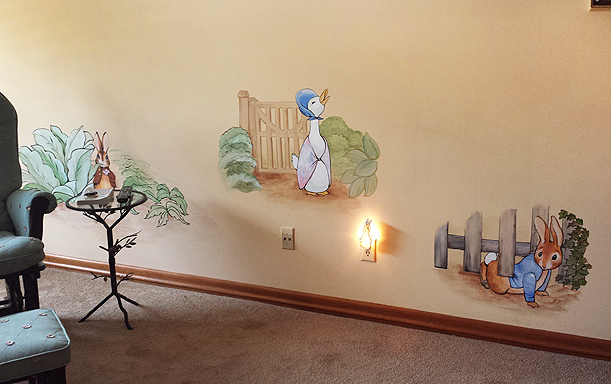 This Peter Rabbit nursery is just what I love to paint: soft, sweet, alive, and timeless. Immersing myself into these 20 characters and their surrounding, while listening to my audio books, I revitalized my soul. My clients have become fast friends and I’ll cherish the joy of this room with them for many more grandchildren to come. This is exactly why I chose to do what I do. You can see more detail pictures on my website www.jmeillustrations.com. in the “Baby’s Nursery” gallery.